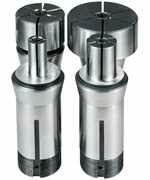 Expanding Mandrels are used to hold a workpiece on it's bore enabling the outside to be turned. Working in a similar way to a split collet (only the other way round! 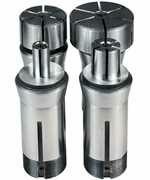 ), a split sleeve is mounted in the bore of the workpiece and expanded to grip the bore via an internal taper. Since the sleeve is split from both ends it expands equally along it's length when tightened onto the tapered pin. Note: These products are not designed for use in the jewellery industry.